Kennedee Cox of Paramus Catholic took over the state lead in the girls long jump, the River Dell girls blasted one of the state's fastest times in the 4x800-meter relay and Shauntae Nelson of Piscataway had a big day at Wednesday's Metropolitan Invitational at the 168th Street Armory in New York. Cox, a senior, exploded for a huge personal best 18-10 to win the long jump to move into No. 4 all-time in Bergen County history and overtake teammate Tiffany Bautista for the state lead. Bautista is now NJ#2 at 18-7. In addition to Cox's NJ#1 long jump, the Paramus Catholic girls also received victories from Isabelle Dely in the 55 hurdles in 8.18, from Mariah Fede in the 55 dash in 7.32. Fede was also second in the hurdles (8.38) and second in the 55 hurdles (8.38). River Dell cranked out a NJ#3 9:37.76 as Amanda Mircovich (2:19), Kellie O'Donnell (2:29), Adriana Scipioni (2:29), and Maggie Mircovich (2:19) shared the baton. Those were season best times for Amanda Mircovich, O'Donnell, and Scipioni. 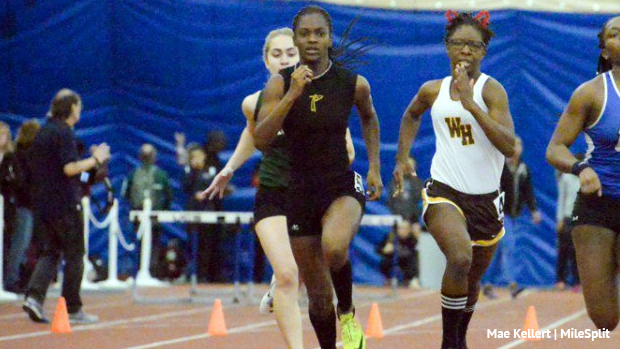 Nelson, a senior, won the girls 200 in a NJ#3 25.08, and ran a leg on Piscataway's winning 4x200 that clocked an NJ#4 1:44.80. Three state leaders, Kyle Lipscomb of Linden, Sydney Woods of Demarest, and Jenna Rogers of Rutherford all came up with victories. Jahmir Ferris took down the Rahway school indoor record in the triple jump with his winning mark of 43-2, which is NJ#8. The former Rahway school record of 42-11 1/4 was set last year by Brian Diaz, who set the outdoor school record of 46-5"last spring. Jimmy Vargo of Delsea broke his own school record with his winning time of 22.75 in the 200. The Scotch Plains boys, the state Group 3 Relay champs, picked up wins from Kyle Estivene in the 55 hurdles in a NJ#5 tying 7.56, and from Jacob Leigh in the 55 dash in 6.59. The Westfield boys shattered a school record with its victory in the 4x200 in a NJ#5 1:31.72. In a great three-way battle in the boys vault, Marco Morales of Delsea finished first on misses at 14-10. His brother, Nico Morales, was second at 14-10, and Conor Reilly of Union Catholic was third, also clearing 14-10. In other N.J. highlights, Pope John won the boys 4x800 in a NJ#8 8:08.36. Stephanie Nwankwo of Jefferson won the girls shot put with a 39-3. Kaylee Stenderowicz of Kittatinny captured the girls triple jump with a mark of 38-7. Jadyn Terry of Piscataway won the boys high jump (6-2). Eugene Kim of Rutherford won the boys long jump (20-10 1/4). In the 4x400's, Northern Highlands won the girls (4:12.60), and Old Tappan captured the boys race (3:33.98).